Justice Sidney Linden, commissioner of the inquiry into the death of native protester Dudley George in September 1995, ruled in May 2007 that the OPP, the government of former Ontario premier Mike Harris and the federal government all bear responsibility for events that led to his death. The inquiry findings were released nearly 12 years after an Ontario Provincial Police sniper killed George as police moved in on unarmed protesters occupying Ipperwash Provincial Park. But the dispute between aboriginals and the government goes back decades. The dispute goes back to 1942. It was wartime and the federal government expropriated land belonging to the Stony Point band under the War Measures Act in order to build a military camp - Camp Ipperwash. In the years following, the band tried to get the land back, claiming it contained a burial ground destroyed when the camp was built. Shortly after the war ended, the Department of National Defense said it was willing to return most of the land as long as it could lease back what it still needed for the military base. The offer was later withdrawn. By 1972, tensions were rising. According to the federal minister of Indian Affairs of the time – Jean Chrétien – the Stony Point band had waited patiently for a resolution but was beginning to run out of patience. Chrétien suggested in a memo to then defence minister, James Richardson, that if the land was not going to be returned, the band should be offered another piece of land as compensation. Twenty years later, there was still no resolution. 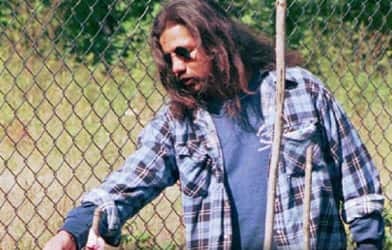 In 1993, Stony Point band members began moving back on to the land. The military withdrew in September 1995, when another group of Stony Point natives marched onto the base. There's no agreement on what happened next. The Ontario Provincial Police moved in on the protesters to remove them from the park. The police say they had no choice but to draw their guns because the protesters were armed; the protesters say the opposite, that they were unarmed and that police - dressed in riot gear - used unnecessary force. And they pointed the blame squarely at then-premier Mike Harris, claiming he issued the go-ahead order for the police to rush the barricades in a nighttime raid. Either way, Dudley George did not survive the raid. He died on Sept. 6, 1995, after being shot by acting Sgt. Kenneth Deane of the OPP. In 1997, Deane was convicted of criminal negligence causing death after a court ruled he did not have a "reasonable belief" George was armed. Deane later resigned from the force. Native groups called for an official inquiry into George's death, but the Progressive Conservative government of the time resisted, saying it had nothing to do with police actions that day. On Nov. 12, 2003, just days after the Liberals swept to power in a general election, Dalton McGuinty announced his government would launch a public inquiry into the matter. The original land claim - the reason protesters occupied Ipperwash Park in the first place - was settled in 1998. Under the $26-million agreement, the land occupied by the former military installation was to be cleaned up and returned to the Kettle and Stony Point First Nation. As well, every member of the band was to receive between $150,000 and $400,000 in compensation. On Oct. 2, 2003, George's family dropped a lawsuit against Harris after reaching a settlement with the Ontario Provincial Police. The agreement included a $100,000 payment for George's family. The OPP said it didn't condone the remarks and that the two officers recorded on the tape had been disciplined. One was sent to sensitivity training; the contract of the other officer was not renewed. On April 20, 2004 - more than eight years after the death of Dudley George - a public inquiry into the events surrounding his death opened. Seventeen groups and individuals were granted standing for the first part of the inquiry, giving them the right to call and cross-examine witnesses. The evidence-gathering part of the inquiry stretched from 2004 through to 2006 and heard from more than 100 witnesses. Allegations of intolerance and impatience at the highest levels surfaced many times. But the biggest bombshell came from former attorney general Charles Harnick in November 2005. Harnick testified that former premier Mike Harris said "I want the f****** Indians out of the park," during a high level meeting about the Ipperwash occupation just hours before the fatal shooting of Dudley George. When Harris appeared at the inquiry in February 2006, he denied using that language. The Ipperwash inquiry ended in August 2006 with final arguments from the lawyers. Linden delivered his final report May 31, 2007. CBC Archives: How do we resolve land claims?